Home Uncategorized WILLIAM WAKES UP Interview + Giveaway! As Jill reminded us in a recent post, this business can be tough. Rejection. Disappointing sales. Occasional unkind reviews that evoke this Taylor Swift song. So it’s extra important to celebrate the good stuff. Like, say, the arrival of new books! In fact, today just happens to be the pub date for William Wakes Up, the companion to William’s Winter Nap. And, of course, there are Chuck Groenink’s spring-themed illustrations. Definitely cause for celebration, especially on the heels of a polar vortex. 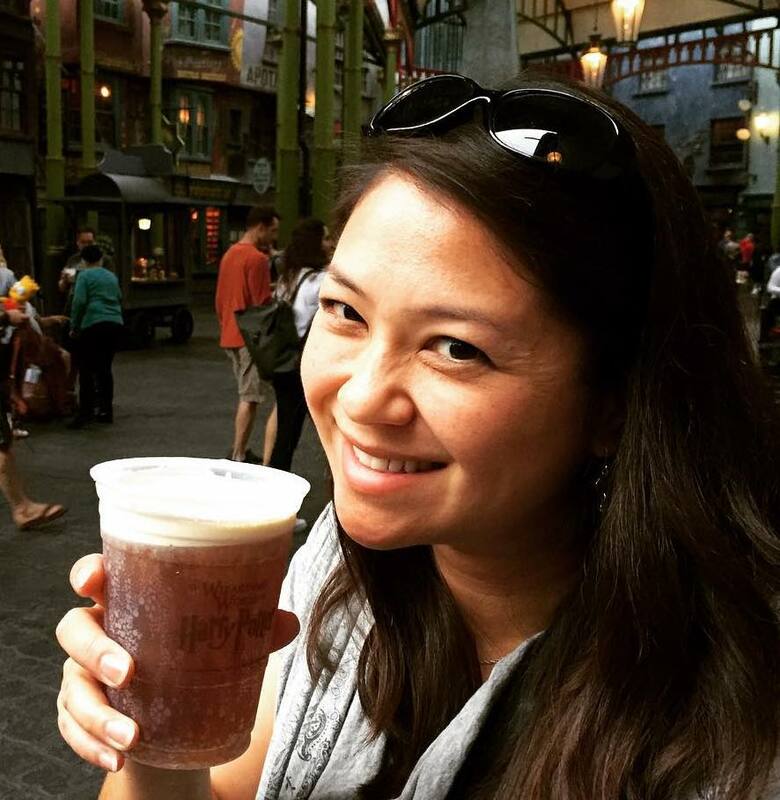 Still, for me, some of the happiest news comes from people like Sara Boncha, Associate Subsidiary Rights Manager with Disney Publishing Worldwide. From Sara, I learned that William’s Winter Nap will be published in Chinese, German, Hebrew and Turkish, and that there’s a German edition of William Wakes Up in the works. Even after many years in the business, I still find the sub rights department a bit mysterious. So I asked Sara if she’d be willing to answer a few questions for us. And, happily, here she is! 1. Hi, Sara! First off, how did you wind up in sub rights? I first learned about subsidiary rights when I was enrolled in the Summer Publishing Institute at NYU. Like 90% of the students attending the six-week immersive program, I thought I wanted to be an editor. But that all changed after I heard the talk by the director of subsidiary rights from Random House. I also love traveling internationally, so she really struck a chord with me about travelling to book fairs and working with foreign publishers. I was sold. I remember immediately after telling my dorm mate that I was going to pursue a career in subsidiary rights. I’d be a missionary of books to the world! 2. (a) How do you spend most of your time on any given day? And (b) what’s your favorite part of the job? (b) My favorite part is when I get an email with an offer to license one of our books—not because I want to see how big of an advance we can negotiate, but because the offer will typically include how enthusiastic the publisher is about our books. I’ve wanted to work with books since I was a little girl, and it’s the only career I’ve ever wanted (except when I wanted to be a jockey and ride horses). My job lets me share books with the world, and learning how our books have resonated with people in other countries is something so exciting that it just never gets old. 3. Can you tell us how these foreign rights deals come about? Our biggest submission to foreign markets is when we compile rights guides for the book fairs in Bologna and Frankfurt. Rights guides are abbreviated catalogs that highlight our titles that we have foreign language rights to sell, including territories who already have licensed rights to our books. Our foreign agents will use our rights guides to solicit interest before, during, and after the fairs. The majority of the interest we receive for our books comes from the hard work of our foreign agents. They are literary agents in key territories that we work with exclusively but who are not exclusive to us, as they represent the interests of other US publishers and literary agents as well. Typically, I’ll notify these foreign agents of our forthcoming titles as soon as we have review materials or when the books have garnered great reviews/publicity. I’ll also send early review manuscripts to literary scouts, who are contracted by foreign publishers to research for them all upcoming titles. When my director, Molly Kong, attends the book fair in Bologna, she’ll take meetings with both our foreign agents and international publishers to pitch our current frontlist of titles, as well as suggest any of our backlist titles that might match a particular genre or topic of interest that a publisher may be hoping to find. Our booth in Bologna features many of our books and review materials for anyone to peruse and even let us know if they’re interested in seeing more our of books. That’s how your German publisher saw William Wakes Up for the first time! We had a printout of some early spreads, the editor spotted them as she walked by our booth, and quickly emailed our German agent to discuss making an offer. 4. Are there particular countries that seem to be the greatest source of offers? 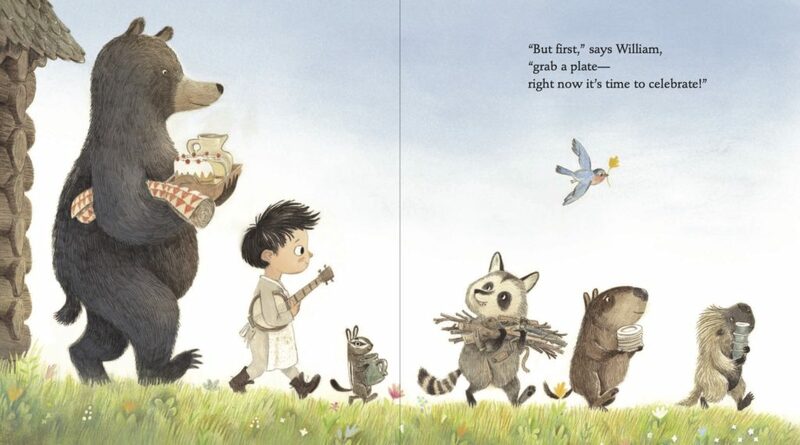 For the past few years, the majority of our picture book licensing has been with China and Korea. However, we’ve had a slight uptick in offers from Europe for our picture books, which has been fun to negotiate with those territories and see how their editions turn out. 5. We’re often told that rhyming texts (like the William books) are harder to sell to foreign publishers given the translation challenges. Has that been your experience? Rhyming can be a challenge, more so with poetry or really “punny” texts. But if the story and illustrations are just right, publishers will find a way for the books to translate for their markets! From my experience, I’ve heard “too American” used more often as an excuse than publishers having issues with rhyming. Stories that are timeless with special artwork are the most successful in foreign markets. 6. You’re also involved in Junior Library Guild licensing. How do those deals come about? I do also submit to Junior Library Guild! I send them all our forthcoming titles available for submission, which they review and select for their club members, who are school and public libraries. They choose what they consider the best books for young readers, and many of the titles they select almost always win awards or garner other accolades like honorable mentions or starred reviews. It’s always a huge honor when Junior Library Guild selects our books to feature for their club members…such as William’s Winter Nap and William Wakes Up! Thanks so much for stopping by, Sara! It’s great to get a peek into this fascinating side of the publishing business. I’m giving away two copies of William Wakes Up. For a chance to win, leave a comment below by March 1st. I’ll announce the winner in my next post. Are you a Goodreads member? You can enter to win one of ten copies over here. Interested in a 4-month mentorship program? Are you a serious writer with multiple well-developed manuscripts? Check out the SCBWI-Carolinas Revision Quest! I’m one of several PB mentors (other genres available too). Open to all. Applications close February 11th. The winner of A Round of Robins by Katie Hesterman from last month’s post is Kathy Wiechman. Congratulations! Chuck Groenink, Disney, Linda Ashman, Sara Boncha, William Wakes Up, William's Winter Nap. Bookmark. Hello, PENCIL! Plus interviews with its creators AND a GIVEAWAY! Thank you for sharing this informative interview. The business end of writing is such a learning process! Congratulations Linda! 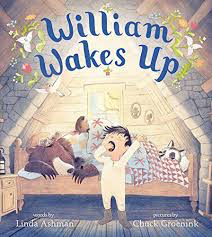 My preschoolers will love William Wakes Up. It sure is, Kathy. After 20+ years, I’m STILL learning! Thanks for reading! Congratulations on your book launch. And it is very interesting to see that the rhyming nature of the book was not a show stopper for foreign sales. Well done! Yes, I was very happy that rhyme wasn’t an issue. Thanks, Jennifer! Thanks for the interview on subsidiary rights! It’s a topic I knew little to nothing about and I’m happy to have a better understanding. William’s Winter Nap is one of my all-time favorite books and I recommend it to everyone I know. These characters have completely captured my heart. I can’t wait to read William Wakes Up! I learn so much on this blog. Thanks for this info and an insight to sub rights. Congrats on the new book. How cool to have books in other languages. Glad to hear that! Thanks for being a regular here, Cindy! This is just adorable. Happy book birthday! I must get these books for my granddaughter. Her dad (my son) come from a long line of Williams. Thank for sharing your adorable books and the very interesting interview with Sara, Linda. It’s a great, classic name! Thanks for reading, Cathy! WOW what an interesting interview. Thanks so much for sharing – we don’t often get to hear about subsidiary rights. So good to know more about this aspect! So glad you enjoyed it. Thanks for reading! Very interesting interview! Thanks for sharing with us. I also wanted to be a jockey and race horses. LOL. Love the books! We have 4 Williams in our immediate family…great name. Another aspiring jockey! Very funny. Thanks for reading, Angie! Isn’t that a great job description? Thanks for reading, Kathy, and congrats again! I had no idea what a subsidiary rights agent did! So fascinating how intricate the industry is and how many unseen strings are pulled to make the beast work. A good education for a writer! It takes a village! An actual global village! Thank you for the post. I appreciated the longer read too! Yes, a global village indeed! Thanks so much for reading, Brian! Great news! Thanks for sharing and congrats!! This looks like a wonderful follow-up to William’s Winter Nap – congratulations! I loved learning more about Sub Rights. Great post – thank you! Congrats on your latest book, Linda! I’m so glad that there is a follow up to William’s Winter Nap! Can’t wait to read it. I have never even thought about subsidiary rights as a career, LOL!, so it was very interesting reading about Sara’s experience. I thought so too, Teresa. Thanks for reading! Thanks for the informative post. I’ve often wondered how rhyming texts are handled as far as foreign translations go. Looking forward to William’s wakeful adventures! What an informative peek into a world most don’t know much about! Yes, it’s a mysterious little corner of publishing for most of us. (Actually, not so little!) Thanks for reading, Carrie! It can be overwhelming with all the many components that make up this business. Thanks for sharing. Yes, it CAN be a bit overwhelming at times. Thanks for reading, Ashley! I couldn’t agree more, Claire. I’m so ready for spring! What a wonderful interview! Love learning more about subrights. Congrats on your WILLIAM sequel! Congratulations and thank you for the wonderful and applicable interview. William looks adorable! It’s encouraging to see a book with rhyming now available to so many non-English speaking/reading children! Thanks for helping to make that happen, Sara! Great interview. Can’t wait to read about William again. Thank you, Linda, for this informative post. It is such good news that rhyming manuscripts are not necessarily precluded from translation for foreign publishers. I agree, Lisa! Thanks for reading! Congrats, Linda!! So interesting to hear about foreign rights. Linda, I LOVED WILLIAM’S WINTER NAP! So did all the kids and adults I read it to! So, of course, I can’t wait to see WILLIAM WAKES UP. Congratulations on having books in various languages! How fun is that! I loved Willam’s Winter Nap so I can’t wait to read this one! Congrats! Thank you, Linda, for sharing your good news and for the informative interview! I can’t wait to “wake up” with William. Wishing you all the best! So interesting! Thank you both for sharing. And I’m looking forward to your new books. Looking forward to reading William Wakes Up, as I enjoyed William’s Winter Nap so much. Thanks, Valerie. So glad to hear that! I LOVED the first book and am looking forward to reading the new one. Thanks for an interesting and informative interview. Thanks so much, Rosi. I appreciate that! What a dream to have your PB translated into different languages and able to bless more children around the world. I hope that happens for me too!! It really is pretty exciting to get that news. I hope it happens for you too, Johanna! I can’t wait to read William Wakes Up! I’m a rhymer myself and have been a huge fan of yours for years. I loved this interview, especially the part about how writing in rhyme doesn’t necessarily mean that your book can’t be translated for other markets. How many times have I heard that!? Thanks so much for posting this! And good luck with the release of the new book! So glad you found it encouraging, Rebecca! Thanks so much for reading! There is nothing cuter than that cover. Looks like my grand babies tucked in. Congrats! Thanks, Mary. I agree–Chuck is such a talented illustrator! Why, thank you, Jackson! I do believe we have one here in your name. I think you will appreciate its exploration of the free-rider problem. These books look wonderful in foreign languages. Thank you for the background information on how the rights work. So interesting. Would love to win a copy of your book. Love your rhyming texts. Fascinating back story! I hope you don’t mind my sharing your discussion at my public FB Got Story” page. Thank you for sharing this info, Linda! I don’t mind at all, Joy. Thanks for sharing! This was interesting. I did not know much about subsidiaries. Thank you! Adorable in any language! And thanks for all of the interesting info on foreign/subsidiary rights. I hope to unlock that author achievement one day! 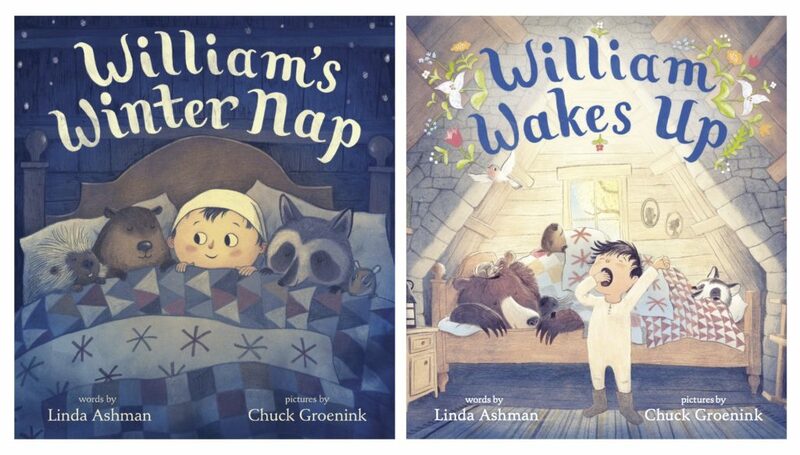 These two books look adorable –between Linda Ashman’s amazing lyrics and the great artwork of Chuck Groenink, these books will be enduring PBs for sure. I had no idea of the complexities of the “subsidiary” world and now that I have read this blog, it raises even more questions for me about what all is involved in that end of children’s literature marketing. There is a whole world out there that I was rather naive about when it comes to the buying of rights to books in other countries. Thank you for this insightful post. I can’t wait to read this sequel! I absolutely adored the first one; it’s on my bookshelf now. Wow, this was really interesting. What a great job! And your book looks delightful – I’m not surprised that people around the World want to be able to read it! This looks like the perfect book to celebrate spring! This is great! I’d love to go to Frankfurt as an assistant! 😊😊 Seriously, I enjoyed the interview and appreciate the chance to win a book! My son would love this book. He looks like the boy in the illustrations. Great article – I had been under the impression that rhyming books are not usually marketable in other countries. Your William books look adorable – can’t wait to read them. Sub rights is pretty interesting–especially learning what types of stories work best. So fun to see the titles in other languages. Congrats! Linda Ashman, you are a GEM. I love your books!!! So fun to know about William’s Winter Nap in other languages!!! Congratulations on your books traveling the world, Linda. Interesting look at subsidiary rights, too. Congratulations on your books! Thank you for the chance to win! Thank you for all of the backstory you offer about the books and yourself! I’d be happy to win a free copy to read and share with my children’s literature students! My granddaughters would enjoy reading this book. I would be tickled pink to win this to ready our only grandchild, grandson Ashton who is about to turn 2 next month. He will bring me one storybook after another. I love rhyming stories a lot and we both crazy love animals that I see pictured too. Cute illustrations. You know a book is truly good when it’s also published in other languages. I’d love to add this to my daughters collection! How exciting. My boys would love to read this book. I know several kids who would love a new book, especially my youngest daughter; she seems to be the book worm in the family now. I’m entering on good reads to increase my chances. Wish would have seen the application for mentorship before the deadline, but maybe next time.